Since the next influx of residents will be more technologically advanced, nursing home facilities must adjust and prepare appropriately. Doing so will also increase the attractiveness of their facilities for those in need of care and will produce a win-win situation for both the upgraded facilities and their residents/patients. Non-invasive, wire-free monitoring: wired patient monitoring systems are not only bulky and cumbersome, they are also constant reminders that the senior isn’t in the comfort of their own home and is in a care facility instead. This continuous reminder can negatively affect the psyche of the resident. Non-invasive wireless monitoring systems allow seniors to move freely while retaining a homey, healthy feel. Motion sensors: sensors can be placed in walls, within individual living spaces, or even inside bed mattresses and chairs, effectively tracking individual senior’s gait, stability and movement patterns. These strategically placed sensors can help identify changes that reflect an increased risk of falls. This information informs nurses and health professionals of patient situations, enabling them to take appropriate proactive action and care. Managing alarm fatigue: alarm fatigue is the desensitization of clinical staff to patient monitoring alarms and alerts, which occurs when clinicians are exposed to an excessive number of alarms. Upgrading to accurate monitoring systems is the best way to tackle this issue, as they allow nurses to trust and react to real alarms. Today, care facilities are making an effort to upgrade to systems that specifically cater to their environment and patients in order to comply with the new CMS guidelines. These platforms are designed to deliver alerts to care givers at nursing stations or on their handheld devices, without disrupting resident’s in the room. Electronic Health Records (EHRs): EHRs are designed to hold and share information with all providers involved in a patient’s care. EHRs also allow a patient’s health record to go with them—to other health care providers, specialists, hospitals and nursing homes. Staying up-to-date with the latest EHR software will make sure that all professionals stay informed of the latest patient updates, to improve care and coordination. Education: involving the elderly with technology has become even more crucial than ever. With the onset of advanced technologies, seniors now have the world at their fingertips, allowing them to feel more capable and informed. By introducing them to strategic mHealth, social media, communication and travel apps, seniors can be more involved with their surroundings and connected with their loved ones. Investing in senior care means investing in our loved ones and our futures. 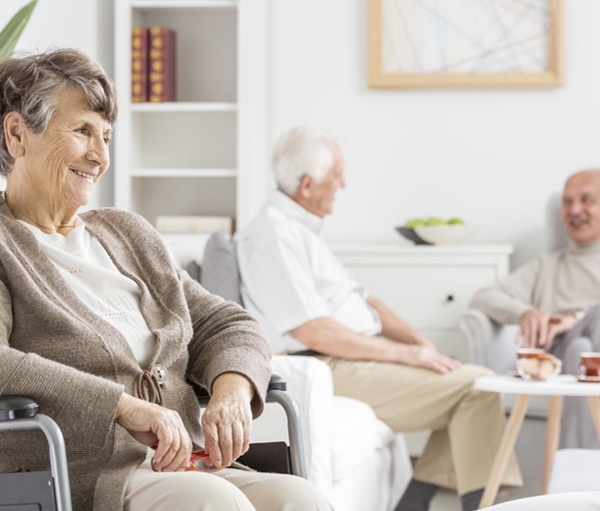 By integrating a combination of widespread and advanced technologies into nursing facilities, we can do our part in improving and elongating the lives of the seniors, allowing them to enrich our lives in return. Learn more about our continuous monitoring systems.